Discovering Lasersaur project that aims to construct an open source laser cutter feels like the best thing to have happened this week. I think I already confessed before that here at LGW we are big on personal fabrication and manufacturing. Which is why it was very exciting to talk to Addie Wagenknecht, member of the Lasersaur team. Hi Addie, when and why did you start exploring the idea? We started working together in 2006 while we were students at NYU’s ITP Masters Program. At ITP we developed CUBIT (the open source multitouch system) as a thesis project. We gave ourselves 3 months and $1000 (we split the cost two-way) to develop the platform and software including documentation. After graduation we were invited to be Fellows at Eyebeam Technology Center in NYC for the year to follow. At Eyebeam we developed the TouchKit and VirtualAwesome framework. We received international attention immediately for ‘demystifying’ multitouch and creating an open source option in a world of 25k+ systems: we did it for less then 2k. In 2009 we left all the institutions we were affiliated with to start our lab. This not only meant a loss of total funding, but a loss of access to equipment. We also did not want Venture Capital, but we needed access to the machines… So what do you do? Over a few beers we thought it might be interesting to try to make one. It was part joke, part dare. We are into personal fabrication for the same reason people were excited about personal computers, desktop printers, camcorders, and CD burners. All of them democratize the means of cultural production. People with ideas should be able to realize them without having to depend on the guy who owns the super computer, printing press, or CD burner. Personal fabrication can completely change the dynamic of consumption and consumerism — for the better. Furthermore, thinking about how society changes when more and more things can be made locally fascinates us. We believe that the DIY/maker/hacker movement will have a profound impact on how societies function in the future and laser cutters are a key tool for these communities. 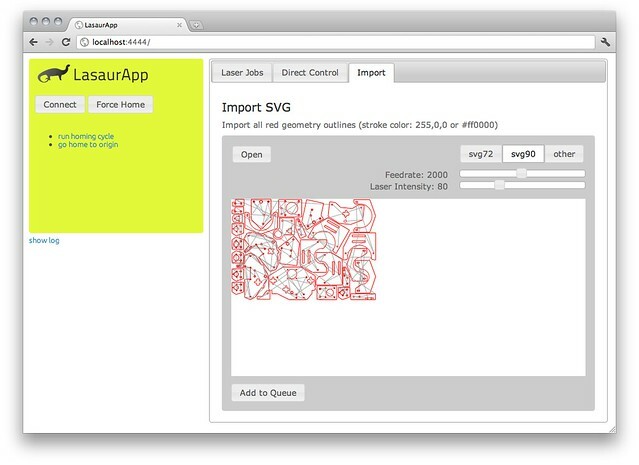 When did you start prototyping Lasersaur? We got funded with kickstarter in Sept of 2010, at that point we had already been doing research and building CAD models… The actual build started almost as soon as we received the money for the materials. I'm a bit puzzled about the price of construction of one unit. E.g. summing up parts listed at http://labs.nortd.com/lasersaur/bom-suppliers-eur makes the overall cost of parts around 3.5K euro, but the Custom Parts Kit is anounced for $512. This isn’t about building the cheapest machine. We are more interested in building a platform that is sourceable worldwide. We want a platform that is safe, simple to build, reproduce, duplicate and understand. We want you to truly own it, and have access to all the designs that went into it. We also are writing software and plug-ins from the ground up which will do things you have never seen before (open source software or not) but this takes money. So, when people buy the custom parts kits from us (rather then say cut those pieces themselves) or even give us a few dollars donation they are literally supporting the current and future of the project. This micro donations to keep the ramen flowing and the R&D a'going. The software is actually a locally hosted web app. The idea is that everyone in a lab can connect to a network and instantly print without having to transfer everything to another computer and hope that the files were imported correctly. So you don't have to put your files onto a crappy old computer which then requires you to import them and often can muck up your files if not your time. When the project is done, do you plan to start some business around it? Again, we decided against the VC route after lots of VC meetings and realizing its not in the project or communities best interest. We have had a lot of makers interested and request a plug'n'play system that wouldn't be a 'kit' per se but more of a nomadic system which would be easier to move, use and share. We have spent the last year talking all over the US and Europe and its been a pretty consistent theme in our interactions. Its definitely something we are considering and the community is supporting of but now I think its just a question of how. 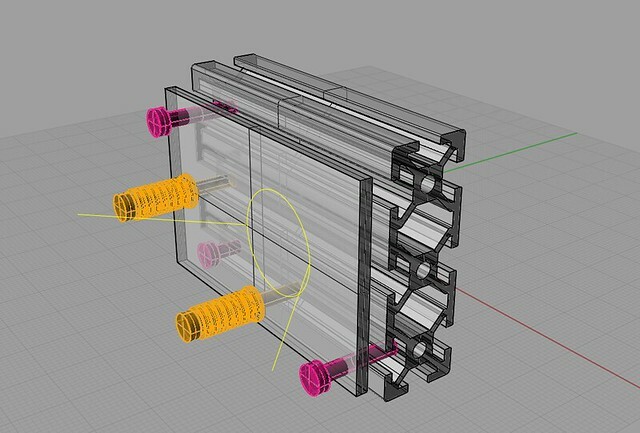 We are working on some really exciting updates in 2012 with some brilliant people from Hyperwerk Basel, I think these Lasersaur updates could be world changing for the open source and personal fabrication communities, so stay tuned. The software is already available at Github, the CAD data will be made public when the financial goal is reached, and it's mere 12% away from reality. You can help to make that happy moment come sooner. For news you can follow Lasersaur on Twitter. Love it! It remind me of the Open Source Ecology project. Do you know any way to get in touch with the Lasersaur people (specifically Stefan who maintains the GitHub repo)? Oddly enough, there is no way to contact them on their website, and I don’t have (and neither want) a twitter account. I wish to talk to them about converting their CAD files to open source FreeCAD, but at the moment their GitHub repository only offers Rhino V5 and Sketchup skp files, which are unusable on Ubuntu. A STEP file of the whole assembly would be best, and could be opened in almost any 3D CAD program. Since I was already thinking of creating a GitHub account for my own use, I just did and opened an issue on the LasaurModel GitHub repository. Hopefully Stefan will answer positively to this request. I still don’t get it. $512 covers what? People are under the impression that you will get a complete kit including laser and software for $512. Doesn’t seem realistic for the average person. I am thinking when all is said and done, you will be invested well over $4000 dollars. So what are we actually looking forward to? Rob, I’ve just asked Lasersaur folks about it, and they intend to fix the confusion in a while. Soo, looks like you gonna have somo project in this part of open source laser tech, right ? Very nice concept and I am hoping that this can cut like a bandsaw blade. If they can enhance its performance they can go along way using this. I hope that they can create different version of this machine for different types of materials. Do you have a kit price part update for 2013? Has any High-school or Vocational school educational material been created. e.g. a short course with hands on lab? How is the software drivers coming along? Interface to off the shelf CAD/CAM software? What upgrades for laser cutters or slightly advanced options are out there?